New York City is home to a lot of people. Gargantuan lunch rushes and throngs of adventurous eaters seeking new, creative, and cost-efficient food are some of the key characteristics of the Big Apple. So, as expected, food trucks are popping up like crazy. We took to the streets to check out some trucks and see which really stood out. Some of these are tough to find, so be on the lookout for the Food Moves app, coming soon to your device. It offers real-time GPS tracking of food trucks, up-to-date menus and specials, and exclusive deals and discounts. 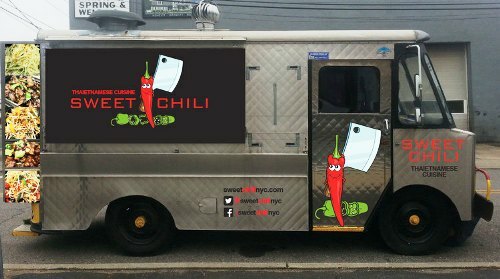 Anyway, here are 15 can't-miss trucks in NYC! Ever had a Russian dumpling? No? Well, you’re missing out. First of all, Anton’s was voted one of the top 50 dumplings in NY by NYMag. The dumplings have also been featured on CBS news, as well as the NY Times and a few smaller publications. A crispy outer layer leads to a fluffier one and then finally some flavorful meat or potatoes. Anton’s serves “Siberian” Beef/Pork blend, Chicken or Potato dumplings. The dumplings are prepared and then given an additional round of spice after they’ve been cooked. Then, the toppings. Sriracha, soy sauce, sour cream, dill, chives, or the tantalizing smoked gouda fondue. Pick what works best for you! And as always, enjoy a free half-sour pickle, courtesy of Anton. Don’t missed these bite-sized flavor bombs. Anton’s can be found around Greenwich Village on Fridays, Saturdays, and Sundays, from 12PM until they sell out (which can be quick, so hop to it!). Since 1971, Uncle Gussy’s has been serving up hot food to Midtown, NY. The family-owned cart had its humble beginnings with Uncle Gus himself serving hot dogs and pretzels, but is now serving up a full Greek menu to hungry New Yorkers. The fare includes chicken, pork, and lamb, available in platters, pita wraps, or salads, and amped up with quality spice blends imported directly from Greece. Feeling especially hungry? Tackle the gargantuan Hercules Box, which includes a protein of your choice, yellow saffron rice, crispy fries, salad, and pita. For vegetarians, don’t miss the fried, hand-rolled zucchini fritters. Get your Greek on in front of 345 Park Avenue, weekdays from 10AM-4PM. Big D serves up the flavors he grew up with in Queens, NY, so prepare your tastebuds for a bold adventure across a diverse palate. Think sweet, Korean bulgogi beef, spicy kimchi puree, and a refreshing crema, all in a taco, sandwich, or rice platter. Or maybe you want to try the zesty ginger chicken, with fresh chopped cilantro. Or maybe you’re in the mood for spicy, Korean pork. Or you want to try Big D’s personal favorite, the spicy chicken. Complete the meal with old bay fries, crispy, hearty Yuca fries, unbelievable pork and chive dumplings with three different sauces, corn cakes, omelettes, or breakfast burritos. Big D’s has got amazing food for everyone to enjoy. 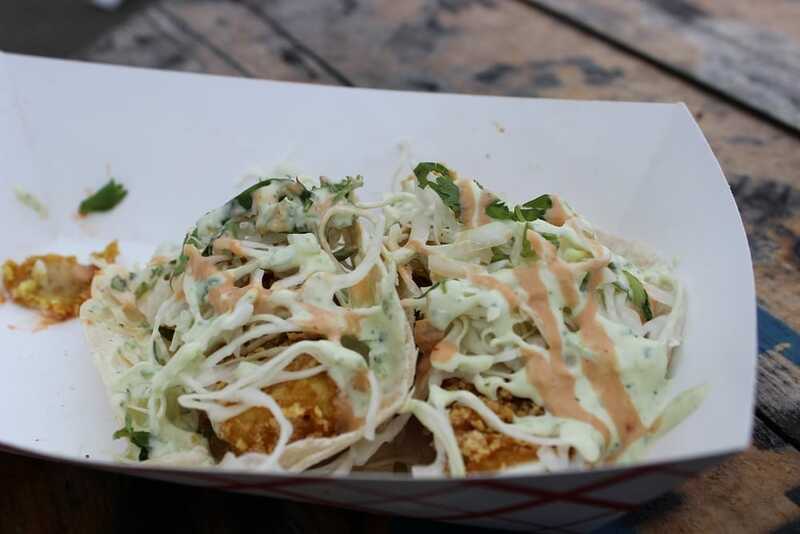 Find the two food trucks in Manhattan’s Financial District and Brooklyn’s DUMBO. Organic flour, local eggs, local apple cider, organic spices, no hydrogenated oil, no trans-fats, no shortening. These hand-made donuts start with the best ingredients. Then, the Carpe team adds a little magic and gives you some of the fluffiest, tangiest, and sweetest Apple Cider donuts you’ve ever had. Balanced flavors and perfect, light textures make every bite better than the last. Feel free to round out the perfect donut with the addition of local apple cider, a soul-warming hot chocolate, coffee, ice cream, or hibiscus lemonade. A quick stop at Carpe Donut is sure to give your day a sizeable boost. Catch them roaming between Between Midtown Manhattan all the way down to Brooklyn. The Cinnamon Snail conducts a symphony of unbelievably diverse flavors. The Cinnamon Snail will change the way you see vegan food. From Korean BBQ seitan to Creole-spiced tofu. Or seitan simmered in porcini mushrooms with parsnip/sage bread pudding, cranberry-orange relish, and roasted garlic aioli on a grilled baguette. Or the “Beastmode Burger Deluxe”, with an ancho-chili seitan burger grilled in maple-hickory BBQ sauce with jalapeno mac n cheese, smoked chili coconut bacon, ay arugula, and chipotle mayo on a grilled pretzel bun. There are also many more menu items, all equally ready to knock your socks off. Trust us, you gotta hit the Cinnamon Snail. If you’re a taco fan (which you are, because tacos are amazing), then you’ve got to hit Coney Shack. The menu boasts a wide range of inventive Mexican fare. Think caramelized, Vietnamese pork, crispy, beer-battered fish, garlic and lemongrass chicken, Vietnamese-style beef short rib, and five-spice calamari. Don’t worry, vegetarian friends, they’ve also got some ridiculously delicious king oyster mushrooms marinated in ginger and garlic, as well as fried, crunchy tofu. The dishes are amped up with pickled vegetable, sauteed onions, crunchy fried shallots, and a variety of sauces and oils. Wanna mix it up? 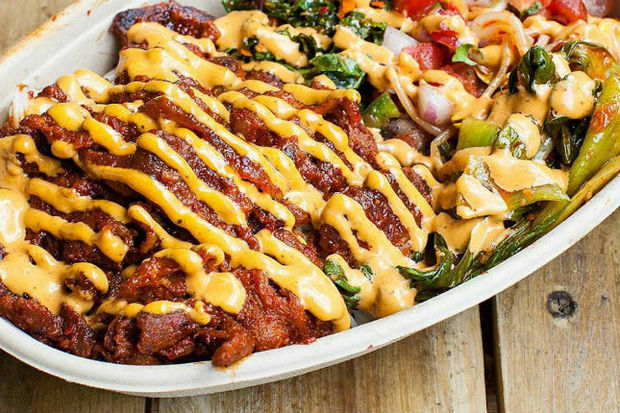 Try a rice bowl, or burrito, or quesadilla, or even throw some fried fish and toppings on an all-beef hotdog (the ‘Holy Phuc’). Huge menu, huge flavor, can’t miss dining experience. Find them roaming around Coney Island, and occasionally in Manhattan. You guessed it: eggs are the star here. Arturo has mastered the art of the egg, and serves up his hearty creations for breakfast. Check out standard fried egg platters with pancakes and bacon, or spice it up with a chorizo fresco sandwich on seven-grain bread. Go for a classic western omelette, or power up with a steak and egg taco. Want something a little lighter? Then the turkey and egg-white sandwich is for you.The truck also offers cajun-twisted Mexican fare, like the cajun chicken burrito supremo. Give them a visit in Midtown during the week from 5AM-2PM, they’re eggsactly what you’ll need to get through the day! Buttery, flaky, the right touch of crispiness. The perfect croissant. Try Frenchy’s croissants and taste for yourself. Get it plain, get it with chocolate, try the ham and cheese. Or try another one of the amazing pastries, like the apple turnover or almond-chocolate-pear tart. You can’t go wrong. Couple that with a delicious cup of truck-brewed coffee and you’ve found the best way to start your day. Find them in Crown Heights on Eastern Parkway and Franklin. Burgers and fries. Often made, rarely perfected. That’s where Frites ‘n’ Meats comes in. Custom-built burgers. Grass-fed angus or luxurious wagyu. Three types of bun, five cheeses, seven toppings, and ten sauces. Plus double-fried, belgian style fries. You can also opt for the skirt steak sandwich, or trust the evil geniuses behind the grill and try the ever-changing burger of the week, often with special ingredients like truffle guacamole. Check it out, burgers this well-done are rare. Frites ‘n’ meats served during lunch hours from 11AM - 2:30PM during the week, and moves between Midtown, Financial District, Soho, and DUMBO. A New York City fixture. The Halal Guys can be spotted thanks to the block-long line that often forms from the wonderful, spiced aromas wafting from their steel food cart. 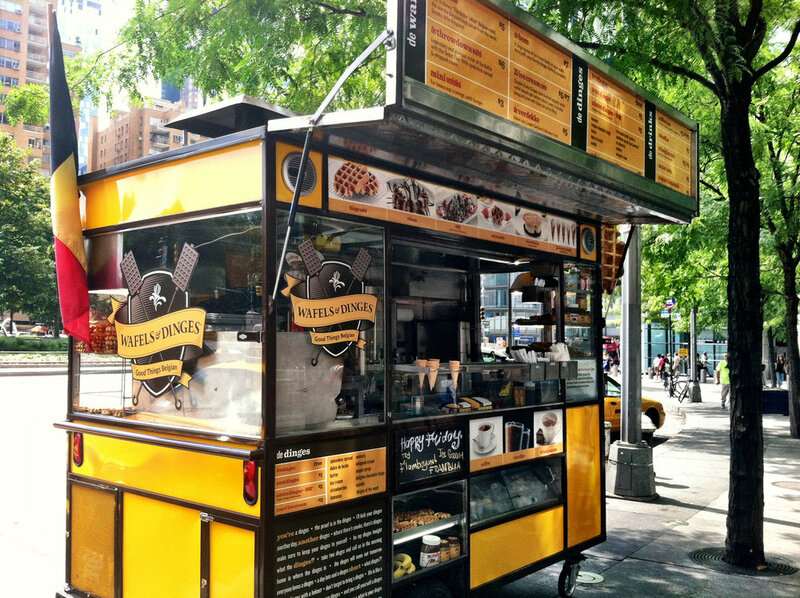 They’ve since expanded, but the flagship food cart can be found on 53rd Street and and 6th Avenue. The fare may seem like a typical halal cart, but these guys carefully balance flavors with and provide homemade sauces and sides. Chicken, beef, or falafel in a pita or with rice. Though the menu may seem a bit spartan, the flavors and quality will knock your tastebuds into next Tuesday. Make sure to go easy on the hot sauce, unless you can handle the heat. Korean-Mexican fusion. Never had it before? Now’s your chance. Slow braised ginger soy chicken. Sweet and spicy marinated pork shoulder. Thinly sliced, sweet and savory marinated beef ribeye. Garlic and sesame baked tofu. Seasonal fresh vegetables. House-made kimchi. Five tastebud-tingling sauces. Burritos, rice bowls, and salads. Korilla’s bold BBQ flavors will rock your palate. Follow them on twitter for truck locations, they move around quite a bit! 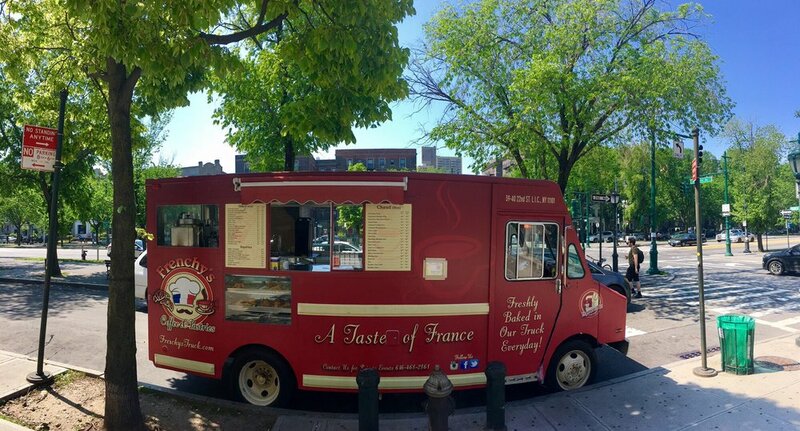 This truck utilizes a professional Brazilian Churrasco grill as the main tool for serving up some of the juiciest, smokiest meat in NY. Amazing chicken, juicy top sirloin steak, and aromatic chorizo. These awesome proteins can be served in a platter, or on crispy french baguettes with all the trimmings. Round out the meal with onion rings, fries (they come in original, lemon pepper, cajun, or made with sweet potato), empanadas, or a chorizo sausage. Come hungry. Authentic, mouth-watering Venezuelan dishes have hit the streets of Manhattan. MetroArepas specializes in- you guessed it- arepas. Amazing, truck-made white corn cakes are used as the framework for a variety of amazing sandwiches. Whatever you’re in the mood for, MetroArepas can provide. Beans, sweet plantain, juicy shredded beef, chicken, or pork, eggs, fresh vegetables, avocados, plus a variety of sauces. Or, try their rice or salad bowls for a different take on the same, amazing blends of spice and fresh ingredients. Find them in Midtown West from 11AM-3PM during the week. You can catch the aromas from blocks away. Sweet Chili cooks up some heavenly Vietnamese fare for the DUMBO area in Brooklyn. 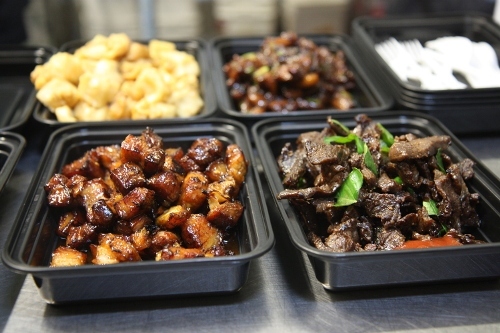 Sweet chili chicken, honey pork, coriander-marinated Beef, or miso-glazed silken tofu. Green mango, papaya or bean sprout salad bases. Warm jasmine rice. Prepare to be enchanted by delicate balances of sweet and spicy. Don’t be afraid to throw a fried egg on top of anything, either. Plus grab a side of coconut chili rice cakes, crispy pork dumplings, or some sinfully special sriracha fries. If you’ve spent time in the city, you’ve likely seen a few of these yellow trucks dishing out hot waffles and myriad tasty toppings. Start with a wafel: the Liege Wafel, a sweet, denser and more caramelized waffle, or the Brussels Wafel, a lighter, airier waffle with crisp outside. Some larger locations also have savory creations with a hashbrown waffle. Then, the toppings. If you’re feeling sweet, you can go for maple syrup, belgian chocolate fudge, dulce de leche, strawberries, whipped cream, nutella, bananas, confectioners sugar, and lastly, the unbelievable spekuloos spread, which is thick, silky-smooth, creamy, spread often called ‘cookie butter’. Fav truck didn't make the list? Let us know! We'd love to try it out. And remember to join the waitlist for the new Food Moves app so you can stay up on all the best food trucks.